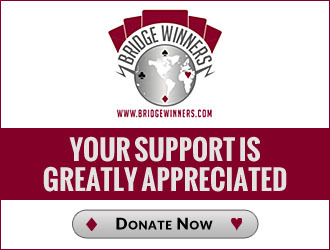 I just love bridge, which I have done ever since my grandparents taught me the game when I was 8. Today I run a bridge magazine, Bridge in Norway, write a bridge column in a newspaper three days a week, and play for Norway and professionally in the best events around the world. I also have a wife who is a fine bridge player, and this year our son won the U16 European Pairs Championships! It will be interesting to see how long we can keep our daughter (now four) away from this addictive and beautiful game.